The Golden Ears Bridge is built across Fraser River in Vancouver, British Columbia, Canada, and was opened to traffic on 16 June 2009. TransLink, the South Coast British Columbia Transportation Authority, constructed the bridge and a network of connecting roads to address local traffic congestion problems. 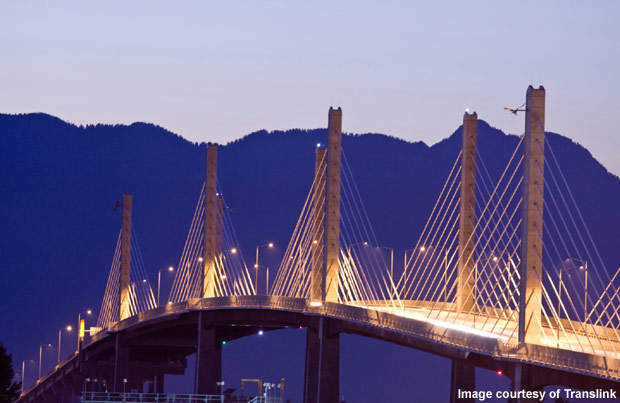 The Golden Ears Bridge design was inspired by the Alex Fraser cable-stayed bridge. The bridge provides a new connection for the communities of Langley and Surrey on the south side of the river with the Maple Ridge and Pitt Meadows communities in the north side. The Golden Ears Bridge is a six-lane bridge built across Fraser River in Vancouver, British Columbia, Canada. 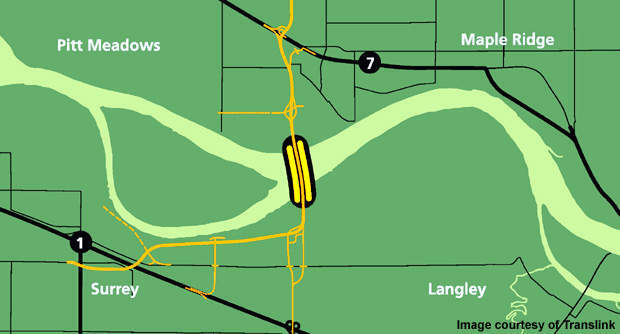 The bridge provides a new connection to the communities of Langley and Surrey south of the river with the Maple Ridge and Pitt Meadows communities in the north. The Golden Ears Bridge was built under a $1bn (€800m) public private partnership. Translink, the South Coast British Columbia Transportation Authority, constructed the bridge and a network of connecting roads to address traffic congestion in Lower Mainland and the eastern parts of Greater Vancouver. Golden Ears Bridge is the most significant road project in Greater Vancouver after the construction of the Alex Fraser Bridge in 1986. 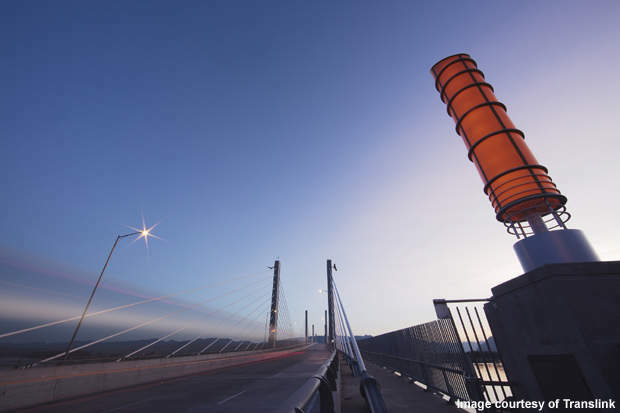 The Golden Ears Bridge reduces travel time across the river by about 40 minutes. It further benefits the regions by promoting economic activity and recreational opportunities. The name Golden Ears was given to the bridge after the Golden Ears peaks, a landmark of lower Fraser Valley. Construction of the Golden Ears Bridge and associated roads project began in April 2006 and was completed in May 2009. The project opened to traffic on 16 June 2009. Translink stopped the Albion Ferry, a free vehicle and passenger ferry service across Fraser River, for the bridge’s opening. The ferry service sailing between Albion in Maple Ridge and McMillan Island near Fort Langley has been operational since June 1957. The Golden Ears Bridge is the main part of the Golden Ears Crossing highway connection across Fraser River. The bridge and road network project creates an additional link from the Trans-Canada Highway to the city’s road network. The network includes connection of Surrey and Langley with 128 Avenue, Lougheed Highway and the Pitt Meadows Airport Way. Golden Ears Way, a two-to-six lane road has also been designed with intersections for streamlining the traffic movements on Golden Ears Bridge. The project includes 13.3km of two, four and six-lane mainline roadways and the Golden Ears bridge across the river, 5km of on and off-ramps construction, an upgrade of 12.2km municipal streets and 2km modifications of provincial highways and interchanges. The project also includes additional 16 bridges with a total length of 4.6km consisting of 112,000m2 of bridge deck. The 1km Golden Ears Bridge is a five-span, six-lane extradosed bridge with two navigation spans. The connecting structures include 4km of elevated highway and 9m of associated connector roads. TransLink will recover the costs of about $900m for the bridge and associated road construction, labour and materials through tolling. The bridge comprises three equal main spans of 242m each and side spans of 121m. The deck is a composite concrete and steel structure built using prefabricated steel elements and precast concrete deck panels. The cable stays, main girders and vertical concrete pylons work in two parallel, single vertical planes. The main pylons of the bridge use a shallow transverse crossbeam of the deck for a transverse frame action. The arrangement enables usage of a single access and maintenance gantry across the entire length of the main crossing. The cable stays, arranged in simple harped configuration at a flat angle, result in low slender pylons about 40m above deck level. 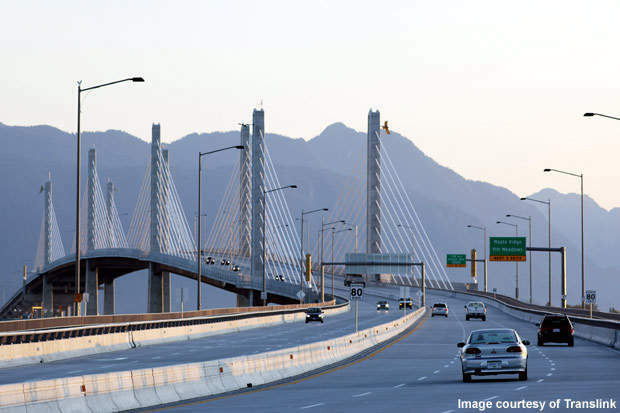 The 1.4km bridge approaches are made of precast, prestressed concrete girders and a concrete deck. The bridge also follows the aesthetic design of the natural environment surrounding the Fraser Valley region. It features sculptured lighting, golden eagles and a fish trap-style fence. Native trees and shrubs are planted along the corridor to blend in naturally with the surrounding landscape. The bridge design was inspired by the Alex Fraser cable-stayed bridge. Environmental certification was given for the construction of the Golden Ears Bridge in August 2004 followed by a benefit agreement signed by TransLink and the Katzie First Nation. Preconstruction activity began with test works in April 2006 and construction officially started in June. The main bridge work began in summer 2006. The main challenge for the construction team was the development of large-diameter bored piles for the foundations to protect the soft silt layers of Fraser River and to save costs. The piles are sunk to about 90m below the river. The main bridge has pedestrian and cycling pathways of 2m on either side of the vehicle traffic, and is protected by a concrete barrier. Four bridge piers support the eight towers and pylons rising to a height of 80m while the deck is 40m above the river. The bridge has 160 stay cables of 20cm with more than 50 strands each to hold the deck in place. The deck, made of 18t reinforced concrete panels, has a surface of about 6.1-6.4m. 792 piles lie beneath the vehicle lanes on the bridge and 396 reinforced concrete panels lie beneath the pedestrian and cycling sidewalks. The deck panels are covered with a 50mm layer of concrete to create a driving surface. By early 2009, the concrete overlay on the deck panels, closing spans and installation of lighting, fencing and signals was completed. The ship-impact walls on main bridge piers, landscaping, environmental remediation areas and pedestrian and cycling connector pathway from Meadowtown Centre to Dunn Avenue were completed by summer 2009. Design and construction of the Golden Ears Bridge project was realised in an environmentally responsible way. Construction from 2006 to 2009 was carried out considering the breeding and migratory cycles of birds, mammals and fish. The bridge is designed to have a minimal effect on the marine life and the project routing was calculated for low impact on the valued habitats and ecosystems. Some bridge components were produced and preassembled off site and floated by barges to the construction area to minimise disturbance to the commercial and recreational users of Fraser River and the wildlife. Noise mitigation walls were also constructed as part of the project. In March 2006, Translink awarded the design, build, finance and operate contract of the Golden Ears Bridge and associated road network to the Golden Crossing General Partnership (GCGP). GCGP financed the project under a 35.5-year agreement with Translink. GCGP is owned by Bilfinger Berger Project Investments and it will maintain the project up to 2041. The Golden Crossing Constructors Joint Venture (GCCJV) carried out the design and construction services of the project under an agreement with GCGP. The GCCJV is led by Bilfinger Berger Canada and CH2M HILL. The conceptual, preliminary and detailed designs of the main bridge were designed by Buckland & Taylor. Several other companies involved in the project include: Fraser River Pile and Dredge, B&B Contracting, AMEC Americas, McElhanney Consulting Services, Trow Consulting Services, Imperial Paving, Bel Contracting, Columbia Bitulithic Lafarge, Jack Cewe, Lower Mainland Steel, Hotson Bakker Boniface Haden, Karyo Edelman Communications, Westpro Constructors, Ruskin Construction, AGRA Foundations, Griffiths Pile Driving, Mud Bay Drilling, Geopac West and TMC Rebar.